Little High Rock Canyon Wilderness contains some 48,353 acres wedged into the volcanic uplands between High Rock Canyon Wilderness to the north and High Rock Lake Wilderness to the east. This area contains the deeply cut drainages of McConnell and Little High Rock Canyons. Elevations in Little High Rock Canyon Wilderness rise from about 5,000' to the summit of Mahogany Peak at 6,940'. Although there is enough water flowing in the canyon bottoms to support some willows and some stands of chokecherry in addition to small riparian areas and meadow complexes, the primary vegetation in the area is sagebrush. While hiking around you may come across pronghorn antelope, mule deer, California bighorn sheep, coyote, mountain lion and sage grouse. You'll probably also find lots of raptors nesting high in the canyon walls. 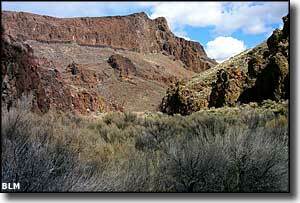 Most folks access the Little High Rock Canyon Wilderness from Washoe County Road 34 and the High Rock Lake Road. The intersection of those two roads is about 60 miles southeast of Cedarville, California and about 50 miles north of Gerlach, Nevada. Little High Rock Canyon Wilderness is part of the Black Rock Desert-High Rock Canyon Emigrant Trails National Conservation Area. Photo of High Rock Lake Wilderness courtesy of the Bureau of Land Management.